Imagine the surprise on your little one’s face when they see their reflection on one side of a large metal spoon right side up; and, then “you” make them turn upside down on the other side of the spoon! It is also fun to make silly faces in your reflection of a metal spoon, just like a mirror. It is really all about convex and concave surfaces, but to your child it seems like magic. Your older kids may enjoy researching why convex and concave surfaces change your reflection. 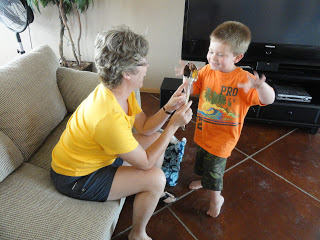 Who would have thought a simple spoon could be so much fun? So, throw in a little meal time entertainment and amaze your kids!